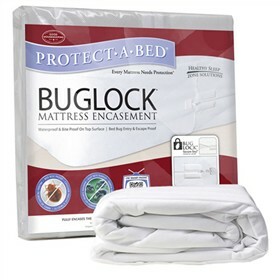 The Protect-A-Bed® BugLock Mattress Encasement features a unique three side zipper system with a SecureSeal that eliminates spaces where bugs could enter. It has polypropylene exterior and polyurethane lining lock in irritants that create a waterproof surface. This encasement is independently tested to eliminate bed bugs from bedding and is machine washable. The Protect-A-Bed Buglock Mattress Encasement King Size 15 inch Deep has many exciting features for users of all types. See the Protect-A-Bed Buglock Mattress Encasement King Size 15 inch Deep product video and gallery images above for more details. The Protect-A-Bed Buglock Mattress Encasement King Size 15 inch Deep is sold as a Brand New Unopened Item.